Peter Foucault Solo Show at the Red Poppy Art House Artist Reception Thursday September 6th! Please stop by the Red Poppy Art House on Thursday Sept. 6th from 6-9pm and check out the artist reception for my solo show! 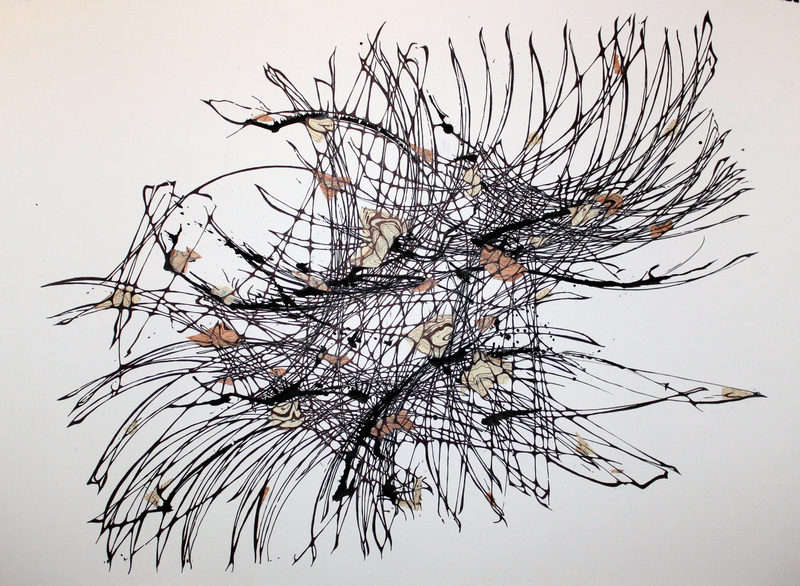 The Red Poppy Art House is pleased to present new mixed -media works by Peter Foucault investigating the nature of drawing and community, where chance factors and collaboration exchange and collide to develop what ultimately becomes the finished piece. In his current body of work, Peter Foucault creates a series of drawing projects where outside factors influence the creation of abstract compositions. Among the selection of works presented in I Walk the Line, Foucault has collaborated with a small sensor driven robot that interacts with the artist and the public at large to create layers of mark making which he later returns to the studio to further translates these layers, decoding the algorithm generated by this machine interface. Additionally, other works presented include Belgium beer suspended in blobs of ink which Foucault then blows across the surface of the paper to further build on his mark making and collage techniques. Fueled by a love of drawing and mark-making, Foucault’s works presented at The Red Poppy Art House explore the tension between control and the loss of control, where viewer interactivity plays an integral part in many of the drawing installations and large-scale artworks on view. Based in Oakland, Foucault’s work has been included in group shows at the Smithsonian Institutes’ Freer and Sackler Gallery, Kit Schulte Contemporary (Berlin, Germany), The University of Salford (Manchester, England), The NASA Aimes Research Center and The Orange County Center for Contemporary Art among numerous others. Recent reviews of Foucault’s work have appeared in The San Francisco Chronicle, The SF Weekly, ArtWeek, Wired Magazine, Stretcher Magazine and he is the recipient of grants through the Creative Work Fund, the City of San Jose’s Pubic Arts Program, the Seattle Center Foundation and the City of Oakland’s Cultural Funding Program. The Red Poppy Art House was established in 2003 as a neighborhood micro-center for artistic and intercultural life in San Francisco. Operating from an urban storefront of 650 square feet, it seeks to demonstrate the unique, powerful and irreplaceable capacity of small and intimate spaces, charting the course for an alternative model for community engagement in the arts. As a small-scale venue, the Poppy hosts over 150 diverse performances, exhibitions, workshops, and artist residencies annually. Wow a busy week! I invite you to please stop by the Red Poppy Art House tomorrow night and check out the latest iteration of my interactive robotic drawing machine “Attraction/Repulsion”. It will be set up during MAPP (Mission Arts and Performance Project) to create a drawing documenting the acoustic circumstances of the evening with the help of the performers and audience interaction. This event is a lead up to my solo show at Red Poppy which will be opening next week. The MAPP is a homegrown, intercultural, multidisciplinary neighborhood event that takes place the first Saturday every two months in the Mission District. This August’s MAPP features more than 15 venues—garages, cafés, studios, gardens, street corners—which artists transform into makeshift venues for the intimate experience of people and culture. Endeavoring to bridge the cultural divides of our communities, the MAPP gives space and voice to the multiplicity of perspectives and experiences that exist within urban settings. Download the MAPP August 2012 Program with information on every venue and their lineups. Check out the Facebook event (also has information on every venue). Check out the MAPP Facebook Group. Tomorrow my artwork will be on display at SFAI as part of an exhibition called “Robot Petting Zoo” coinciding with Kicker Studio’s Design Device Day. Will be an amazing opportunity to see some of the most talented figures in interactive design speak! Please join Kicker Studio for the 3rd annual Device Design Day (D3) conference on August 3, 2012 at the San Francisco Art Institute. 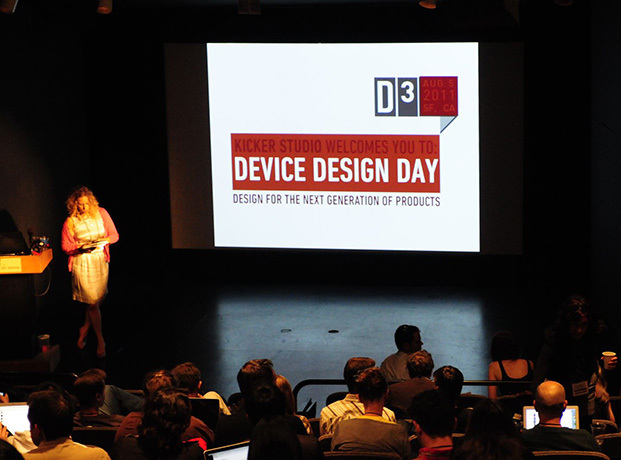 Kicker Studio’s 3rd annual Device Design Day (D3) conference is August 3, 2012 at the San Francisco Art Institute. D3 2012 offers a full day of inspirational discussions that explore the product design frontier. Kicker Studio curated the program to highlight how natural user interface impacts design. By considering theory, best practices, and practical implications, D3 2012 will define what it means to make technology speak human. Leading innovators present talks throughout the first part of the day. During the second part of the day, attendees choose between two panels and a workshop where they have a chance to be more intimately involved in the conversation. Tickets cost $399 and participants can register at http://devicedesignday.com. Kicker Studio, a product design consultancy, makes technology speak human. Kicker Studio creates meaningful, last relationships to products by creating interfaces that feel as natural as a conversation. They work with emerging technologies, such as voice, touch, haptics and gesture, to design natural and intuitive ways for users to access the power of today’s digital devices in their daily lives. Visit www.kickerstudio.com for more information.